antana hybrida ‘Irene’ is a shrub-type Lantana that can get 2-3′ in height with a 6-8′ spread. Irene is similar to ‘Confetti’ with tri-colored blooms consisting of yellow, pink, and red but the colors are more vibrant than the muted colors of ‘Confetti’. The colors of Lantana flowers will change colors with age and vary greatly during the bloom season. Pink is a great color for attracting butterflies and the berries are a food source for birds in the fall and winter. 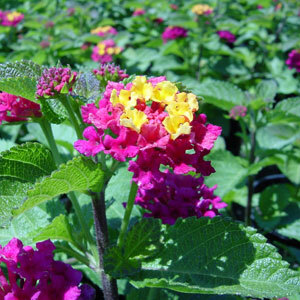 Irene Lantana will bloom late spring to fall and has an upright growth habit. The foliage is very aromatic and can irritate the skin of some people. Irene Lantana should be spaced every 24-36″ when planting.